Because of the huge CCD chip and fast (f2.4) focal ratio, a large (10") prime focus corrector is required. There will be no greater than 8-9% light loss in the extreme corners of the 111.7Mp CCD camera. The Prime Focus Assembly (PFA) is held by a PI hexapod. The back of the hexapod is affixed to the spider cage, which in turn is tensioned to the upper ring of the telescope structure through the spider vanes. 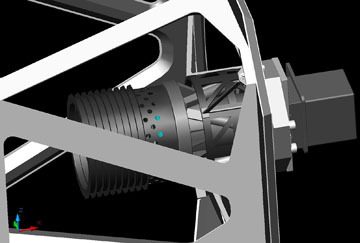 The hexapod gives the telescope an active prime focus assembly, due to its six Degrees Of Freedom (DOF). The hexapod can move +/-2" X, Y and +/-1" Z. All while having the ability to obtain a given actual position within +/-1 micron over the entire range. This allows the use of a "fixed" primary mirror, since the hexapod can move laterally, then adjust tip/tilt and finally come to focus. The system can therefore be perfectly collimated and focused across the entire sky. The telescope structure's declination attachment point is facing down, near the lower/mid center of the structure. The primary mirror covers (carbon fiber) are also shown in the rendering to the left, in the open position. The prime focus corrector resides inside a baffle. The telscope will be parked at a zero zenith angle, thus reducing dust buildup on the prime focus corrector. 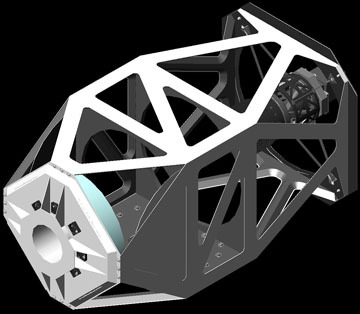 The carbon fiber telescope, with all components shown to the right, will weigh less than 500 lbs. This is less than 1/4 a conventional telescope. A conventional 1m/40" telescope's primary mirror alone can weigh 500-600 lbs. 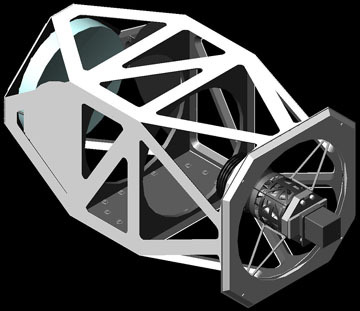 The use of a cellular primary mirror and carbon fiber skinned sandwich core structure and sub components allow this telescope to be lighter, stiffer and track ambient temperatures far better than other telescopes. 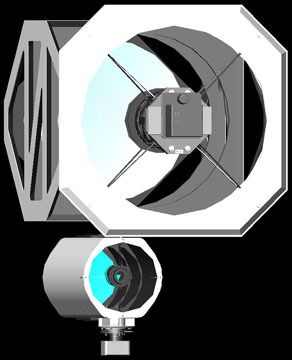 The dome's design was also based around sound thermal features that help to produce the highest Delivered Image Quality (DIQ). If the DIQ can be reduced from a FWHM of 1.25 to 0.85 arc seconds, exposure times can be cut in half to reach the same magnitude: 28 versus 14 minutes to reach mag 25 with a s/n=3 in r'. The comparison to the left shows the 40" Dream above the 0.4m (16") Dream Astrograph for scale. To learn more about The Madawaska Highlands Observatory, please visit their web site.